Heat-resistant and versatile translucent canning funnel fits both wide-mouth and regular-mouth jars. New translucent material allows superior viewing of headspace while filling a key new consumer benefit. Top-rack dishwasher safe. When preheating the jars there is lots of lifting and tipping which can be awkward. 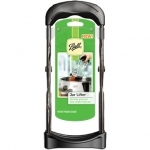 This premium jar lifter is easier to use and eliminates fear of dropping jars when using old metal on glass jar lifters. The Ball Utensil Set helps you safely and easily handle hot jars and lids, fill jars and measure headspace and remove air bubbles. Set includes: Jar Funnel: Place in mouth of jar to fill without spilling, Jar Lifter: Safely lift jars out of hot water with the blue gripping end, Lid Lifter: Lift lids out of how water with the magnetic end -- and Bubble Remover and Headspace Tool: Slide into the side of filled jar to release air bubbles and measure headspace. 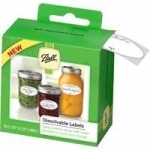 Perfect for purees, creamed soups, baby foods, pie filling, juices, jams, and more. Save time, effort, and money by preparing your own tasty sauces to be used immediately or boiled for future use. Do bushels with ease and in a fraction of the time. Includes the tomato/apple screen with easy twist on design and instruction/recipe booklet. Lifting hot jars out of a canner is no fun with a wet hot pad. Make the job a snap with the Jar Lifter, another canning essential from Back to Basics. 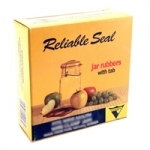 Reliable Seal for Ball type canning jars. Mrs. Wages Home Canning Guide, from America's premier supplier of pickling, freezing, and canning products, brings step-by-step instructions for preserving your favorite garden produce. This guide will walk you through more than 120 tested recipes for old-time favorites like crunchy pickles and strawberry jam, not to mention updated versions of these classics with recipes for low-sugar and sugar-free preserves.